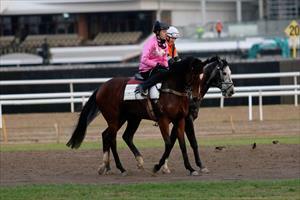 Brutal Power has struck a competitive field for his race at Ballarat on Friday. Brutal Power is in race one, the 3YO Maiden Plate over 1400m with Patrick Moloney to ride from barrier one. At his last start Brutal Power finished a good second over 1400m at Ballarat and Mike Moroney has made a gear change for Friday’s race. “We’ve put blinkers on him just to focus him,” Moroney said. “He’s particularly fit but it does look a handy race as you would expect at this time of the year. “We are very happy with him and he’s got barrier one so it’s up to him today - if he brings his best then I’m expecting him to be hard to beat.